Indian ships and naval assets can now move across from the Pacific to Singapore, Andamans, Diego Garcia, Mauritius, Seychelles, and Djibouti, onwards to Oman. 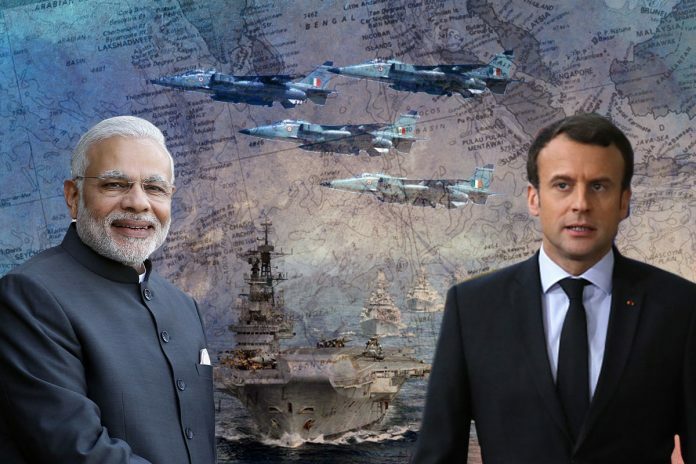 India is all set to firm up a defence logistics agreement with France, just like the LEMOA with the United States. The move will allow India access to French military bases in the Indian Ocean and the Horn of Africa, and round off another critical part of enhancing its military presence in these waters to counter China. The agreement, which is expected to be signed during French President Emmanuel Macron’s visit to India in early March, was firmed up around the time New Delhi worked out the fine-print with Seychelles to build and operate a military base there. What’s important to understand, however, is the bigger picture which is evidently falling in place, and why it’s important not to stop just here. There are essentially two major frames to this strategy – bases which India will build, and bases or ports that its forces can access. On the first count, India moved on Assumption Island in Seychelles and Agalega islands in Mauritius, both on the outer stretches of Africa, with an intent to monitor big shipping traffic moving across the Indian Ocean and also towards the Horn of Africa and to the Persian Gulf. In both these places, India will build infrastructure and operate bases with adequate safeguards to the sovereignty of the country concerned. The other big proposal in this folder, which is under consideration at the highest levels, is a possible base in Oman. That would expand Indian presence to the mouth of the Persian Gulf. However, the entire project would entail a massive expenditure that the government is now going through with a toothcomb. The next category is access India will get by way of agreements with other countries. The LEMOA with the US provides India access to Diego Garcia, the biggest American base in the Indian Ocean, besides Guam, on the edge of the Pacific Ocean. In the same way, the logistics agreement with France will allow India access to the strategically important French base in the Reunion Islands near Madagascar. This is typically the French area of colonial influence, where another opening will be the French facilities in Djibouti in the Horn of Africa. China’s People’s Liberation Army Navy (PLAN) already operates a military base here, its first such base overseas. Another agreement India signed as part of this maritime strategy was with Singapore two months ago at the Defence Ministers’ Dialogue. Through this understanding, India can dock its naval platforms in Singapore for longer periods, use its facilities, and even conduct maritime surveillance missions in the South China Sea. Put together, all of this completes a bigger jigsaw, much of which is now falling into place. As a result, Indian ships and naval assets can move across from the edge of the Pacific, Singapore down to the Andamans, Diego Garcia, then on to Mauritius, Seychelles, and Djibouti, onwards to Oman. This forms the entire arc from the Pacific to the mouth of the Persian Gulf, essentially forming the expanse now termed as the ‘Indo-Pacific’. Australia, too, is said to be interested in pursuing a logistics agreement of the kind the US has and now France will have with India. So, what emerges is a group of interoperable navies collaborating to use one another’s bases in order to build a more effective security architecture in the Indo-Pacific. India will obviously service and station troops in bases that it will build and operate. The idea should be to increase the number of foreign bases in this category. And here is where, the government will have to find the finances and political muscle to see it through. There should be no doubt that India has to make up for lost time and opportunity on this front. While this strategy may look impressive, the fact is China has moved far ahead, threatening to negate Indian influence in its traditional areas of dominance. Maldives is a good example of how China has moved literally into India’s backyard to build a whole port city with a possible base. This, along with its port in Gwadar, Pakistan, provides a perfect entry into the Arabian Sea and down to the Indian Ocean. The Hambantota port in Sri Lanka is, for all practical purposes, now leased to China. This has forced India to go deeper south in the Indian Ocean towards Mauritius. But India must not stop there or become dependent on the US or France. It must explore possibilities in Madagascar, which is like a junction point in the Indian Ocean where routes diverge. Also of big value are the large under-sea data cables in the area, which are constantly being probed by Chinese submarines. China is now able to mount more under-sea missions in the Indian Ocean due to better port access, another cause of big concern. While Seychelles and Mauritius are good starts, what India must ensure is more such agreements and better delivery on the ground. The much delayed Chabahar project in Iran, which was meant to be India’s answer to Gwadar, should serve as a constant reminder on how poor execution can neutralise any strategic advantage or play. France is militarily over extended. They are unable to handle North Africa on the ground or their far flung atolls by sea. They need India too. .Just as US Australia, and Japan do. India must not compromise it’s strong relationship with Russia. It does not need to do so. But, why is India steadfastly ignoring it’s own islands? The Lakshadweep, minicoy and other archipelagos that provide India with a potentially formidable sea fortress if mined with tiny bases and fuel-ammo-supply dumps for fast long range chopper carrying destroyers, midget attack subs and contemporary catalinas?